The 98" NovoTouch LK9810i Panel is a 4K Ultra HD screen with NovoEnterprise for sharing, comparing and collaborating in a conference room or the classroom, using one-click management. Moderation and On-screen annotation function keeps you in control of the meeting and you can collaborate in a real time manner thanks to high speed wifi capability. 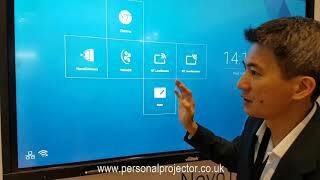 Users can manipulate content with up to 10-points of touch, common gesture interactivity and on-screen annotation. The LED backlit technology also offers a brighter picture, longer life (minimum of 30,000 hours) and lower energy cost.